Music therapy can cover a lot of ground. 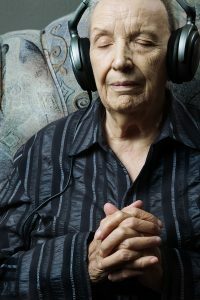 Some aging family members enjoy participating in the music itself, while other family members may be too far along in the process of dying to do more than listen. Regardless, music therapy can be a vital and powerful part of the hospice care that your elderly family member receives. Here are a few of the benefits. You probably already know from other situations that music can help reduce anxiety levels, but you may not realize that your family member can experience lower anxiety levels, too. Even if she’s not able to participate in conversations or in larger discussions, your senior can still experience the benefits of music playing gently in the background. If she’s more active, she might enjoy making some music of her own as well. 2. A Feeling of Support. Music can be a communal event, especially if the music being played has a special meaning for your family or for your elderly family member. She may be able to experience the music as a sort of virtual hug from family members who aren’t able to be there with her as her life transitions to a new stage. 3. Greater Awareness of Time and Place. Listening to music can also become a bridge between the more ethereal place your senior might be in for the majority of the time and the here and now. Your senior family member can be more aware of what is going on around her with the presence of music in the background. If you play music at certain times or play specific songs for certain guests, this can help your elderly family member to stay more in tune with who is there and what is happening. Your family member might prefer hymns or other religious music to be played for her during this time. She might want this as an opportunity to explore music for her funeral or she may simply find it soothing to her soul as she copes with the reality of her own passing. Regardless of the reason, spiritual music can have a relaxing effect for your family member and for everyone else within earshot of the sounds. Regular music therapy can help your family member to accept the dying process. Hospice care providers can focus on the practical side of her care during this time and the musical component assists with the emotional and spiritual side of her care.